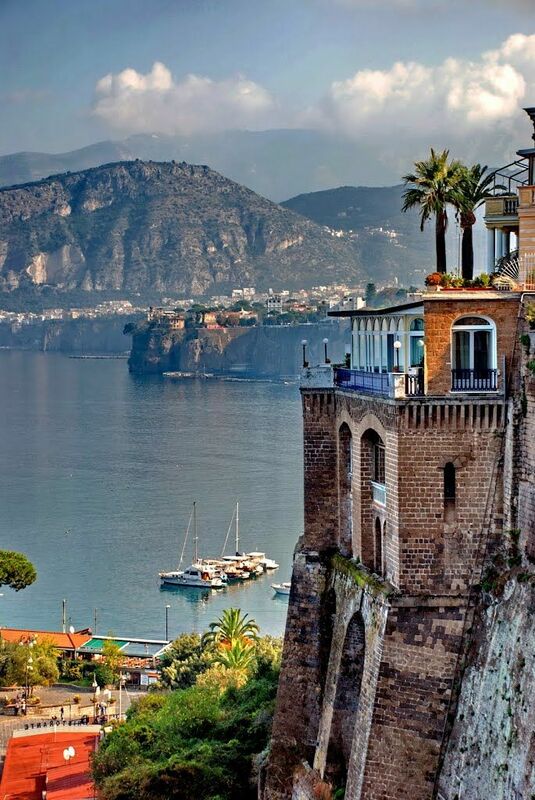 photography of the worlds: Sorrento, Italy! Sorrento (Neapolitan: Surriento) is a small town in Campania, southern Italy, with some 16,500 inhabitants. It is a popular tourist destination which can be reached easily from Naples and Pompeii, as it lies at the south-eastern end of theCircumvesuviana rail line. The town overlooks the Bay of Naples as the key place of the Sorrentine Peninsula, and many viewpoints allow sight of Naples itself, Vesuvius and the Isle of Capri.The Amalfi Drive (connecting Sorrento and Amalfi) is a narrow road that threads along the high cliffs above the Tyrrhenian Sea. Ferry boats and hydrofoils provide services to Naples, Amalfi, Positano, Capri and Ischia. Sorrento's sea cliffs and luxury hotels have attracted notable people, including Enrico Caruso and Luciano Pavarotti. Sorrento is famous for the production of limoncello, a digestif made from lemon rinds, alcohol, water and sugar. Other agricultural production includes citrus fruit, wine, nuts and olives. Wood craftsmanship is also developed.